E.T. The Extra-Terrestrial 4K Ultra HD Big Sleeve Edition / Import / Includes Blu Ray + DVD + Art Cards / Region Free . Fast And Furious 8 Big Sleeve Edition 4K Ultra HD + Blu Ray+ DVD + Art Cards / Region Free. 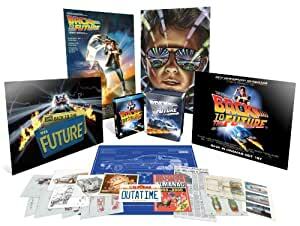 Blu-ray Collector's Tin includes- digipack blu-ray trilogy, Delorean blueprint, Outtatime number plate, Sports Almanac, Save The Clocktower poster, Lenticular photo of Marty's family plus more. 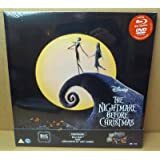 Archival Featurettes o Making the Trilogy: Chapters One, Two & Three: Original 2002 DVD documentary that takes a look back in time. The Making Of Back to the Future Part I, II & III: Provides a vintage and historic look at the making of all three films. Setups & Payoffs: As you watch each of the three films, each “set up” showcases items in the scene that prepare you for a future plot point. When you get to that moment in the film, the “payoff” is shown. There are some films that are just timeless and everyone should watch (especially in today’s climate of remakes, reboots and reimaginings). Basically, see it before it gets horribly remade with overblown computer effects and wafer-thin characters that you simply just don’t care about. By now, you can probably already tell that I love this film and I’m effectively going to ‘gush’ about it, so if you just want to accept now that it’s a definite 10/10 you might as well stop reading now. However, if you’re vaguely interested as to why I think it’s so – technically – perfect, then feel free to read on. 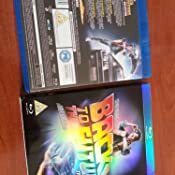 In case you’re one of the few people that have been living in 1955 all your life and have only just arrived in our year courtesy of a time machine, you may need to know that ‘Back to the Future’ is about time travelling. 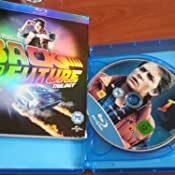 Marty McFly, played by the ever youthful Michael J Fox, gets caught up in eccentric inventor, Doc Brown’s, latest scheme to build a time machine out of a DeLorean car. Naturally, things don’t go smoothly as he inadvertently ends up in 1955 and accidentally interferes with the very moment his parents got together, therefore possibly preventing him from every being conceived. If this wasn’t bad enough, he’s only got a one-shot chance at returning to his own time thanks to a lightning bolt due to power his time machine for the return trip. I think what makes this film stand the tests of time is the fact that it is a true ‘family’ film. Whereas most films which can be watched by children are largely aimed ONLY at them and force the adults to sit through it until it’s over, I can’t imagine anyone – male/female, young/old – not actually finding enjoyment out of this adventure. 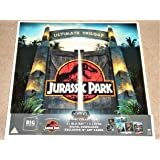 It’s funny without ever being childish or vulgar, exciting without ever being over the top or unrealistic (if you’re willing to suspend your disbelief enough to believe that time travel is actually possible) and, of course, it contains some of the most memorable characters ever committed to film. Naturally, our dashing young hero, Marty, is very easy to root for, however it’s his cranky old sidekick ‘Doc’, played perfectly by Christopher Lloyd who steals every scene and is the true joy to watch all the way through. It’s also worth mentioning that Marty’s on-screen family also can hold their own, played different versions of themselves throughout the time periods, but special mention should go a character who should – by rights – be little more than a stereotypical bully, yet ‘Biff’ somehow becomes the clichéd bully that all other on-screen thugs aspire to be ever after. If this film has a downside – and I’m only mentioning this because I can see that some people may have a problem with it these days (I didn’t and still don’t!) it’s that there are a few topics of humour that some people may find a little ‘edgy’ in today’s PC culture. For some reason I get the feeling that today any ‘family’ movie may shy away from a mother inadvertently falling in love with her son, but it was the eighties and things were different then! There aren’t many movies that still can bring a family together around the TV in the living room on Christmas Day, but this is still one of them. If you haven’t already brought the entire trilogy on DVD, then watch it now and show your children. It deserves to entertain future generations. Yes, the following two ‘Back to the Future’ movies weren’t quite so well-received by the critics, but I think they’re great, too. It's no secret that this franchise is great. 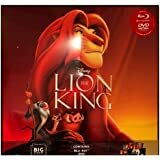 I didn't see the movies before picking them up and thought like I do with everything that it would be awful (thats just how I think so as to avoid disappointment) and to say I liked them would not be doing justice. They may to be the most scientifically accurate movies around and there are some continuity errors and such but there is a certain charm about these features which disarms you and some of the scenes remain tense and exiting even after my 3rd viewing and with its memorable characters and fantastic comedy elements you really couldn't do much better and the 3rd movie almost uniquely doesn't feel like it exists just to pad the franchise it is a good end to events with significant payoff. Sure, some of the effects are laughable by today's standards and there are a few elements which aren't explained properly or are a little to convenient to the plot but those nitpicks are... well they're just nitpicks because this is Back to the Future and Back to the Future is good. 5.0 out of 5 starsYou know, I love that movie, the way they shot it. It's so urm… like futuristic, you know? Classic film! Watched it in science class and probably caught it on TV in the afternoon as a kid. Love Donnie Darko's scriptial reference to it. I like how Crispin Glover is in a world of his own, he's on another screen. A strange and brilliant performance. It's like the other actors and actresses are delivering their lines next to him, with him on a green screen, while he's just let loose. And technically that's almost how it happened. He came onto the scene and did his own thing for the character and the writers went with it; dug it so much that they let him add his own touch to the magic of the movie. Michael J. Fox as Marty is the sweetest cat to lead this film and franchise. There could have been no one else to better alight this. That's much how I feel with Jake Gyllenhaal in Donnie Darko. It wouldn't have worked so well, so beautifully, if another actor had played the part -- it would have been syncopated! No, these two were meant for their respective roles. The same can be said of Glover and the others. I love the mother personally, played by Lea Thompson. She's so great and adorable. There was the change of actress for the character of Jennifer Parker (Marty's girlfriend) between this and the second instalment but I think both actresses do well for the movie and narrative that they're in. The first movie, while a big blockbuster, is more homegrown. Kind of springing out of an initial idea and blooming. The second takes it up a notch and is projected as an even bigger movie in the franchise -- of course, it's a sequel! So the actress for each film suits the tone of the film and Marty's place in it. We'd have preferred continuity but it's still made to work -- at least on the terms of the actress' performance. I might remember liking the sequel better, in that science class or on that afternoon as a kid. I've still yet to see the third. I hear mixed opinions about it. The setting of the wild west doesn't really grab me pleading to be heard or seen out. Returning to the first two movies recently, though, I definitely think the first was and is miles better than the second. They're both great, they're both classics and they do very much go together and the franchise is important in cinema and hailed as some of the best movies, or blockbusters, of all-time. I just think the first was much better. 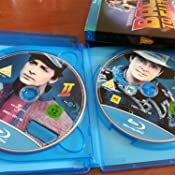 The sequel was one of those that tried to replicate some of the themes of the previous either because it worked or as a cheeky nod, and it's not one of those sequels that relies on re-emulating what came before, but there's enough of it to make me um and err and lean on the side of Back To The Future (I) which can stand by its own merits and be viewed and enjoyed as a single movie without any need to look beyond it. If you had to send but one movie to space, of the Back to the Future franchise, if you could only send one of them to an alien race for them to enjoy or see what we get up to when we have big bucks and time to kill, you'd send the first -- right? Only allowed one. The canister shot to space, that slowly glides to their home planet, only has space for one DVD -- the case or maybe just the disc. It'd be the first. There're some good ideas in the second and it's kind of fun -- when you're a child ever more so, with the winding or unwinding plot and the treacheries of time travel -- but this first film, it's all there, and it's practically perfect. The ingredients, the combination of everything, from the cinematography, to the acting, the script and the timing, to the music and score. It's epic - an epic feature film!